Liviu-Gabriel Bodea holds a Dr.rer.nat. (Ph.D.) title in Biology from the University of Bonn, Germany. 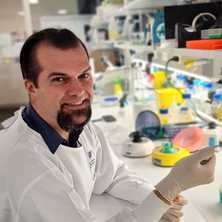 In 2014, he relocated to Australia after being awarded the Peter Hilton Early Career Research Fellowship in Ageing Dementia by the Queensland Brain Institute (Brisbane). Liviu’s work is focussing on the microglial cells, the resident immune cells of the brain parenchyma, and their response and impact on the surrounding environment, under healthy or pathological conditions. To achieve his research goals, Liviu is using in vivo and in vitro models (e.g. transgenic mice, stable cell lines, primary microglial and neuronal cultures), in combination with biochemical and molecular techniques ranging from imaging to functional pathway analysis and gene editing. Additionally, Liviu has extensive experience in guiding both under- and post-graduate students into the wonders of scientific research. Cojocaru, Sabina, Radu, Mihaela, Bodea, Liviu G., Cimpeanu, Mirela M., Gheorghita, Gogu, Stoian, Gheorghe and Dinischiotu, Anca (2013) Water Soluble Pleurotus ostreatus Polysaccharide Down-Regulates the Expression of MMP-2 and MMP-9 in Caco-2 Cells. Notulae Botanicae Horti Agrobotanici Cluj-Napoca, 41 2: 553-559. Bodea, L. -G., Colonna, M. and Neumann, H. (2013). Lack of Microglial Trem2 Receptor Increases Susceptibility to Dopaminergic Degeneration Triggered by Systemic Inflammation. In: Glia. 11th European Meeting on Glial Cell Function in Health and Disease, Berlin Germany, (S65-S65). Jul 03-06, 2013. Linnartz, B., Bodea, L. G., Tenner, A. and Neumann, H. (2011). Desialylation of Neuronal Processes Leads to Complement Opsonization and Complement Receptor-3 Dependent Removal by Microglia. In: Glia. , , (S142-S143). .
Neumann, H., Linnartz, B. and Bodea, L. (2011). Microglial Clearance in Neurodegenerative Diseases. In: Glia. , , (S17-S17). .
Bodea, L. G., Linnartz, B., Colonna, M. and Neumann, H. (2011). Microglial Trem2 Receptor Has a Protective Role for the Nigrostriatal System. In: Glia. , , (S71-S71). .
Bodea, L. G., Dannenberg, H., Colonna, M. and Neumann, H. (2009). Regulation of Dap12 Associated Receptors in Microglia by Systemic Inflammatory Stimuli. In: Glia. 9th European Meeting on Glial Cells in Health and Disease, Paris France, (S132-S132). Sep 08-12, 2009.